Today we'll explore another riveting episode of Who Rocked It?....courtesy of our fab celeb divas. First up I spotted both Oliva Munn and Michelle Trachtenberg out and about in a really affordable faux shearling vest. Olivia was photoed while out doing a little shopping in NYC. This vest is currently on sale if you're interested. Up next, former 3LW/Cheetah Girl member Adrienne Bailon and Basketball Wives LA star Malaysia Pargo rocked the Christian Louboutin Multi-strap Double Platform sandals to two separate events. Adrienne was celebrating her bday in Las Vegas and paired her heels with this form fitting, colorblock sheer dress. She looked so fab! If I didn't read blogs, I wouldn't know who the heck Malaysia was. I'm not a reality show fan. I swear the majority of them are like watching a train wreck...or fame hungry individuals who will do almost anything for the limelight (shameless Kanye plug). Anyhew, she hosted the launch of Three Beats Jewelry recently and sported a gold version of the CL double platform pumps. I can't comment on her talents or personality, but I can say that her dress is soooooo AWESOME!!! I see a DIY project in my future with this thrifted dress I bought recently! The lovely ladies were wearing the above beauties.....which, unfortunately, are no longer available. Unless you're willing to try Ebay. Christian really knows how to design an aesthetically appealing shoe. He's a beast. So, throw in your 2 cents good people. Who do you think rocked their pieces??? I think they all looked fantastic, Adrienne has the body for that dress so she can definitely pull it off, I love the sheerling vest/leggings with the boots look. That vest is really cool, I think any body can rock it. well I love the all black with the vest better its not as distracting and looks more chic. Then of course I love Malaysia Pargo period due to a girl crush but I do like those sandals in black better since I have the same ones in black myself but not the most comfortable shoes, I must add. Loved Malaysia in that dress she got at a local (Chicago) resale shop. It was actually an indian piece and she rocked the hell out of it with those red bottoms! 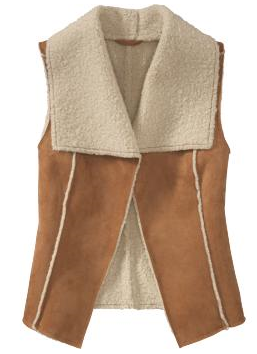 I like the Shearling vest I actually ordered it yesterday online while they were having a 25%off one day sale. I look forward to ROCKING it soon! Such a cute vest!! I might have to go to old navy and get one!!! They all look great! I really like Malaysias outfit! I could see me in it:) lol! In my opinion the vest look better on olivia and the pumps on both!! !